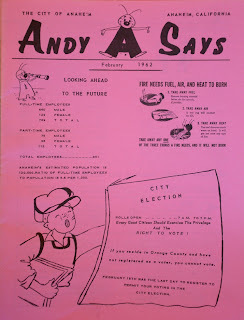 ANAHEIM HISTORICAL SOCIETY: Meet Andy Anaheim! 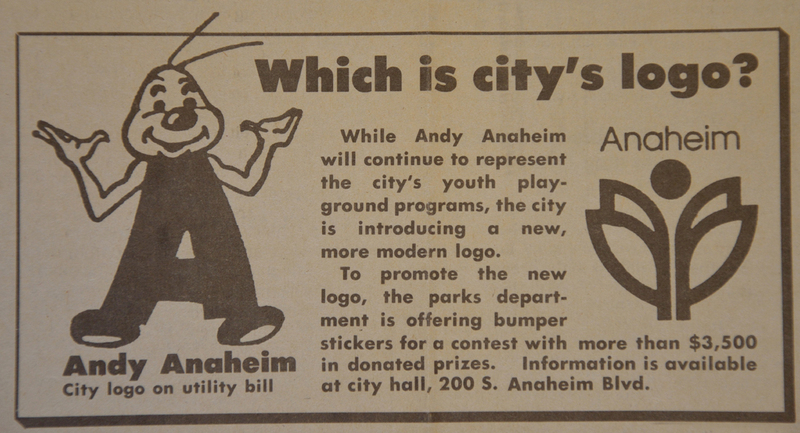 With his ant-like antennae and Mickey Mouse-ish nose, Andy Anaheim was a quirky little cartoon character who became Anaheim's official mascot in 1953. 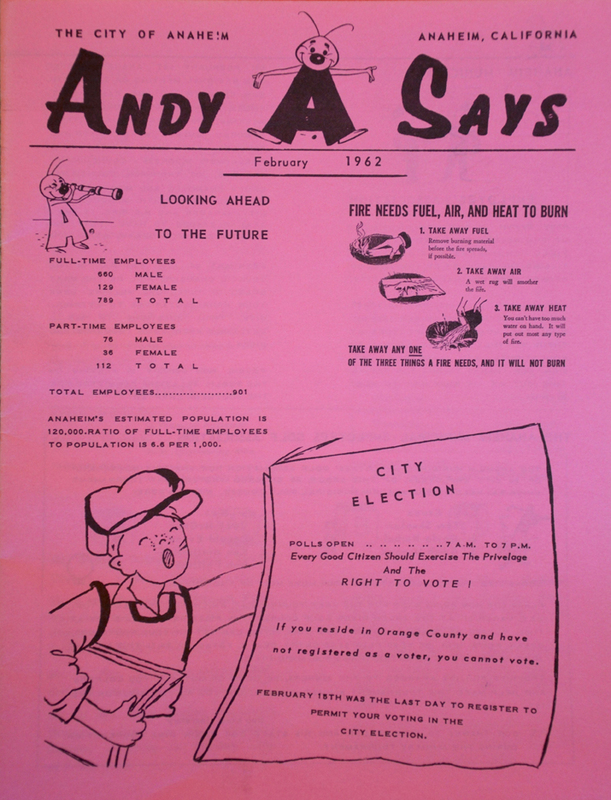 Perpetually smiling, Andy embodied the city's optimism during a period of incredible changes. In fact, his whole body stood for Anaheim, literally, with a capital A! 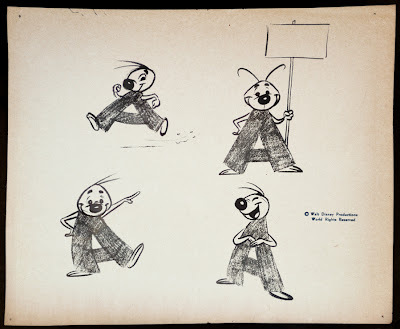 The original Andy Anaheim model sheet, drawn by the Walt Disney Studio, early 1954. Andy belongs to the City of Anaheim's Chamber of Commerce, a generous gift from Walt Disney himself. 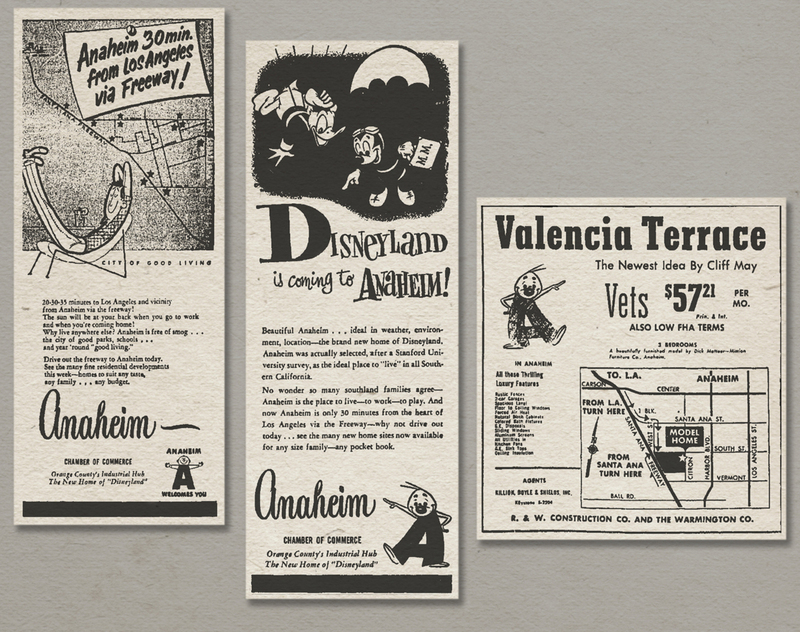 While Disneyland was in its early planning stages, City officials requested a special mascot - a character with a cheerful face to help ease and endorse Anaheim's growth from a quiet farming community into a booming vacation destination for the whole world. 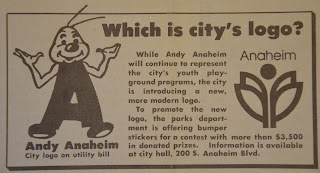 Andy Anaheim helped promote scores of city programs and events. The character was designed (by an uncredited artist) in the spirit of familiar cartoon advertising icons popular in America during that time. Advertising characters sold everything from breakfast cereals to air lines, so why not put one to work representing an entire city? 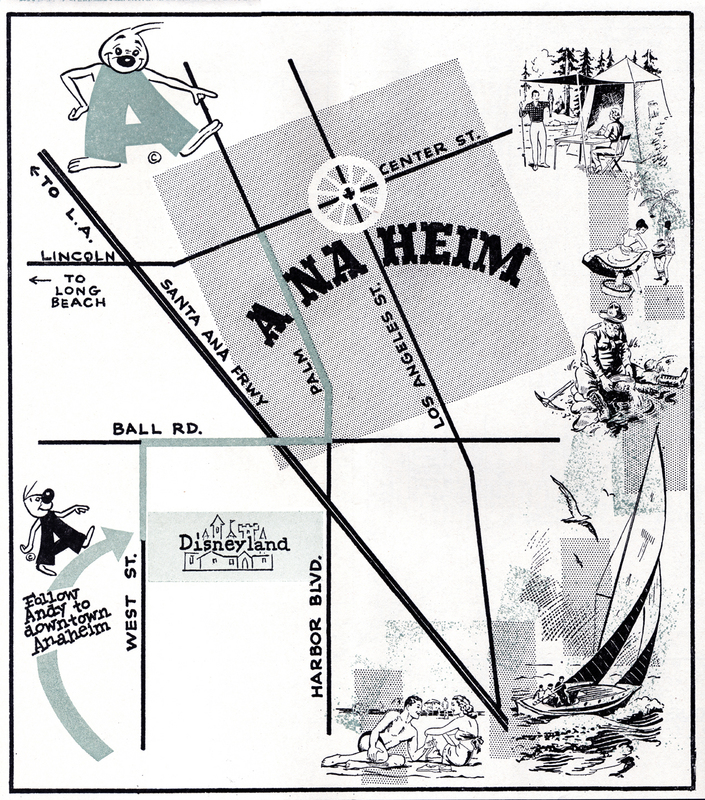 Anaheim's new slogan at the time was "America's Hub of Happiness" with Disneyland being, naturally, "the Happiest Place on Earth." 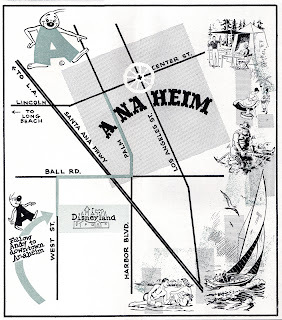 It was hoped that the throngs of visitors lured to Disneyland from around the world each year would also spread their vacation dollars into Anaheim's downtown district, located just one mile north of the Park. 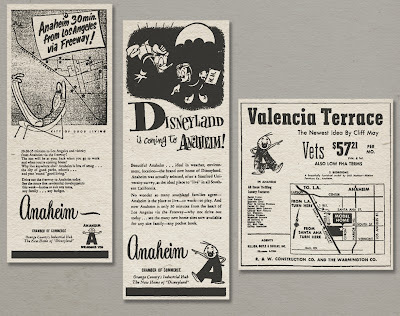 Brochures listing Anaheim's department stores, restaurants, movie theaters and churches were given to visitors checking into the hotels and motels that were popping up all around Walt Disney's vacation kingdom. With property values suddenly on the rise, most of Anaheim's citrus growers were enticed to "sell the farm". Responding to the inpouring of new residents, suburbs of ranch-style homes and tract housing replaced the seemingly endless acres of Valencia oranges, lemons, and walnuts that had once defined Anaheim. A brand new Anaheim with a new focus was underway. 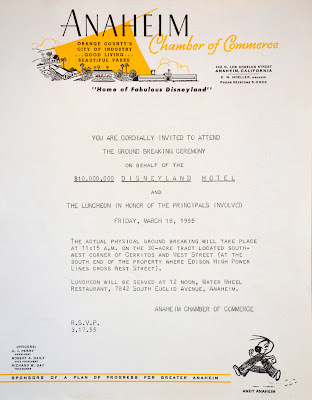 Anaheim Chamber of Commerce stationery, 1955. 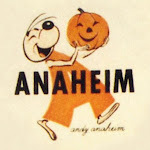 Anaheim's public image has evolved much, as can be charted by a lengthy string of mascots, logos and official slogans incorporated over the years. But of them all, Andy Anaheim remains our favorite. How can you not like him? Sure, we admit he's a little weird, but his unwavering positive attitude is a quality we admire in anyone. For a job well done in lending his friendly face to a city that has always been challenging to define, we give Andy an 'A'. Why isn't there a Disney-designed "Burbank Bee" or "Barney Burbank"?!? Squee! Will the shirt be available in other sizes/colors (either now or in the future)? I would LOVE one or three of these, but I'm afraid I'm too short and girlie to wear a men's tee. Haha! Thanks Major! We agree. Giddy Girlie, many ladies have been asking us the same question. We'll pass your suggestion on to Moonlight Graham! Hello - where/how can I buy one of these shirts!? Hi! 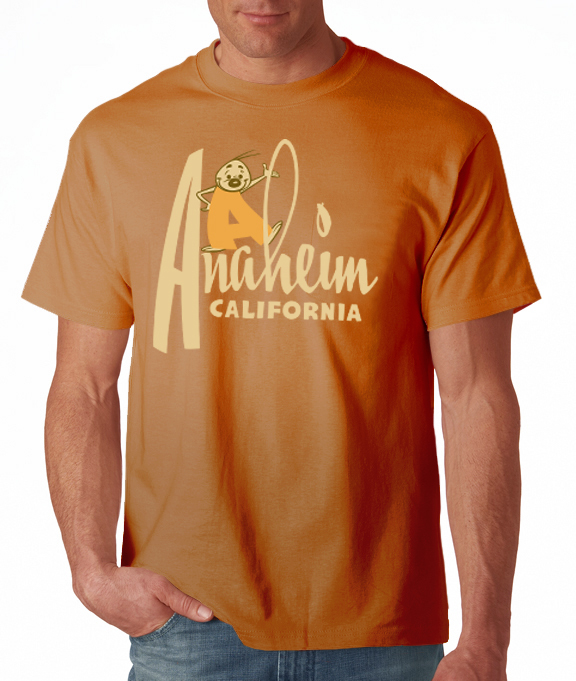 The new Andy Anaheim shirts will be available in the next couple weeks (before Christmas). We will keep you posted! Awesome, can't wait! Thank you! Hi again! Any updates on when the shirts will be available yet? I'm hoping to get one for my husband as a stocking stuffer for Christmas! Hi! One more question... when the new Andy Anaheim shirts are finally in, where will we be able to buy them? It's me again! I never got a response from you guys last year about the shirts :( are they available now? Hi there! Where can we buy the Andy Anaheim shirts?! I would like to buy a couple. Thank you! A Tremendous Afternoon in Anaheim! Anaheim Historical Society on NPR! The Shocking Truth About Anaheim Chiles!